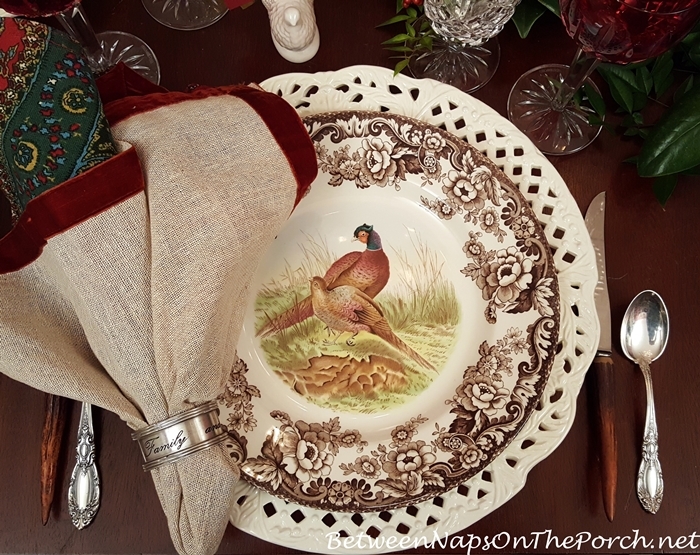 Welcome to the 427th Tablescape Thursday! Happy Thanksgiving to you and your family! 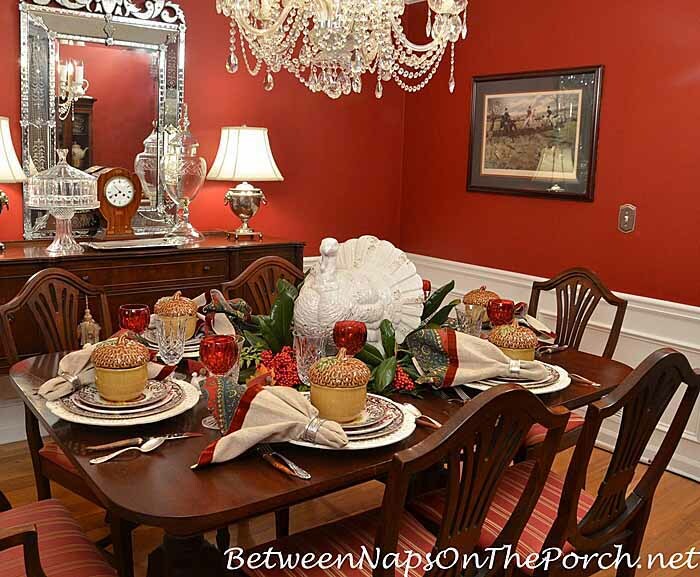 Though I’m not hosting Thanksgiving this year, I put together a table setting to share using the acorn soup tureens I just recently purchased . 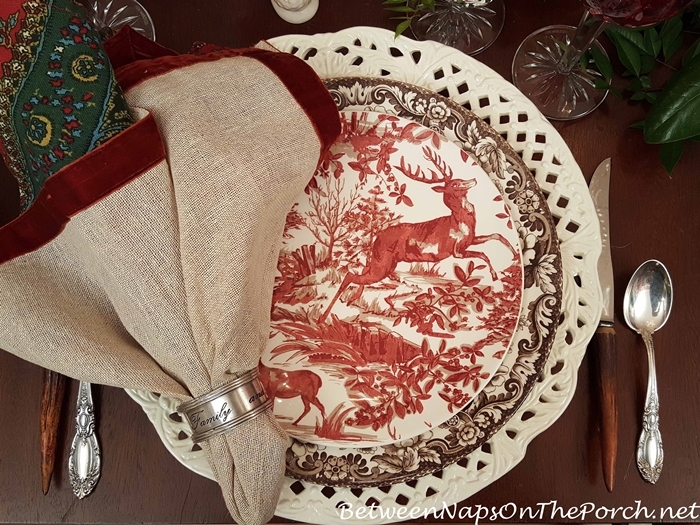 I started out with the idea of creating a woodland centerpiece using deer, but it just didn’t feel right leaving Mr. Turkey out of the picture. I only get to use him on the table once a year so I put the deer away and placed Mr. Turkey in his rightful spot in the center of the table. This year, for part of the time, he donned a scarf that coordinated with the napkins on the table. Mr. Turkey came from Pottery Barn many years ago. The first year they carried him, I passed him up, even after he went on sale. The next year when he appeared for a second time, I brought him home with me. 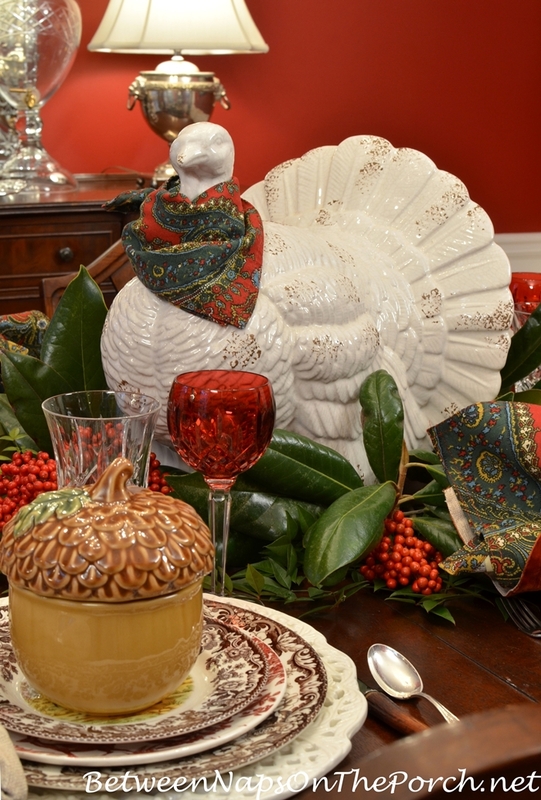 I haven’t seen him again in recent years, although they do have a big, beautiful turkey tureen this year that looks similar here: Large Turkey Tureen Centerpiece. If you look closely, you’ll see a ruby flash salt cellar in the picture below. I pulled one out, thinking I might add them to the table, but never got around to adding the rest. lol They would be a nice complement for the Waterford Ruby Hock wine glasses. The tea glasses are Waterford, pattern is Araglin. You can just see the turkey place card holders I used for this table. 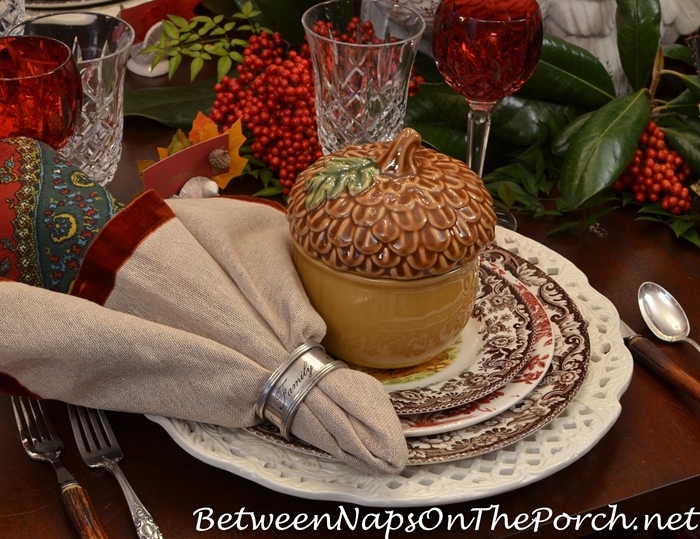 The place cards have little acorns attached, a nod to our acorn tureens. 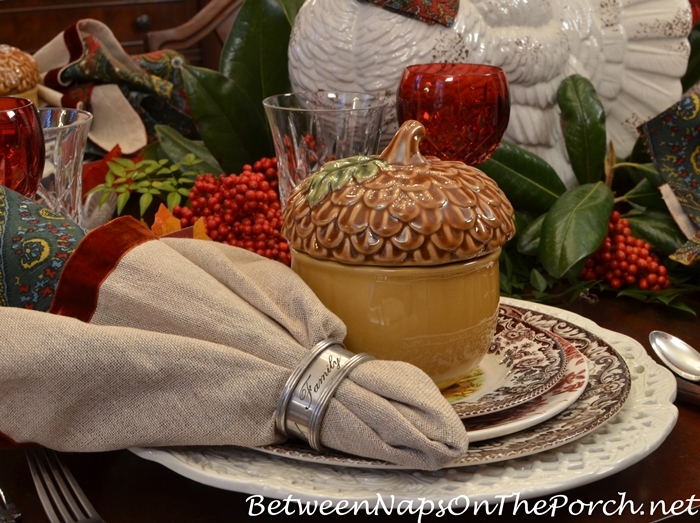 The napkin rings are a favorite for Thanksgiving, they have “Friends and Family” engraved all the way around. I’m surprised they are still available since I found these many years ago. You’ll find them on sale with free shipping here: Family and Friends Napkin Rings. I think the code GIVETHANKS gives an additional 20% off the sale price. That’s an awesome deal, I’m pretty sure I paid more when I bought them. For the flatware, I mixed my Towle King Richard with antler flatware found on eBay many years ago. The antler flatware only included a fork, visible in the photo above, and a knife, visible in the photo below. I love mixing it with other flatware because it makes for a more interesting table. I had fun with layering in this table, more than I normally do. Of course, the soup course served in the acorn tureens was on top. 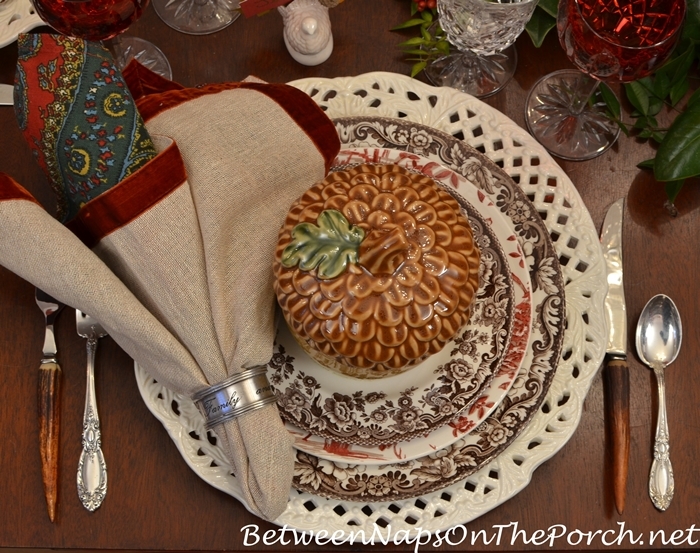 Those were followed by my favorite dinnerware for Thanksgiving, Spode Woodland. They make a “turkey” salad plate for this pattern and in this table it’s being used more as an appetizer plate. They are available here: Spode Woodland Turkey. 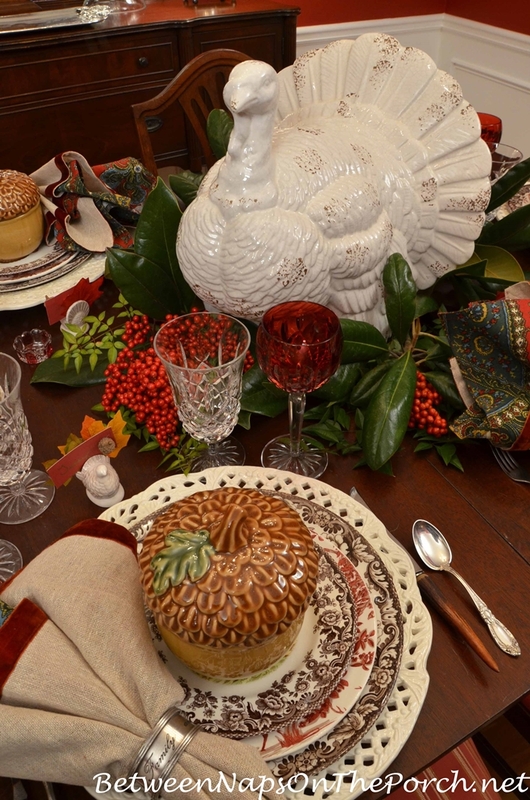 You’ll notice (at that link) they make a complete dinnerware collection in the turkey pattern…love that! Happy Thanksgiving, dear Friends! Hope your Thanksgiving is spent with family and/or friends and is wonderful in every way! Thanks, Delores! Hope you have a great Thanksgiving! Happy Thanksgiving to you and yours! Already threw the turkey in the oven and enjoying my coffee with your blog. Just placed my order for the napkin rings since I had been eyeing them for a year! Glad they brought them back this year and on sale! Love all your great ideas and inspiration! Thanks for a lovely #427! I enjoy all your seasonal inspiration. Happy for you that you have the day off. Your table is beautiful! Happy Thanksgiving to you and your family. Thanks, Mary. I do today and it’s been nice to just relax. Hope your Thanksgiving is wonderful! So pretty. 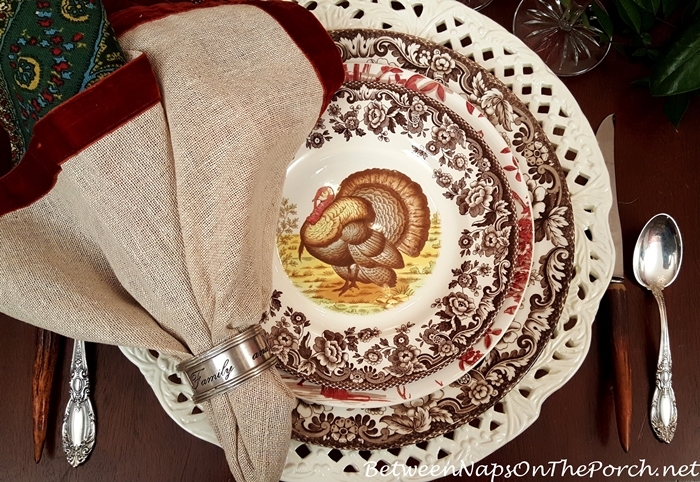 Even though I am going to my in-laws home for Thanksgiving dinner, I HAD to create a Thanksgiving tablescape (for breakfast, perhaps???). Hope you had a wonderful Thanksgiving, Michelle! What a beautiful table. I must have those napkins (both patterns). Where did you buy them? Have a blessed Thanksgiving. Thanks, Bev! I found the ones with the red velvet edging/trim in Pier 1 a few years ago. I’m not sure if they are still carrying them now. I can’t remember where I found the paisley ones but I think it was either Marshalls or HomeGoods. Hope you’re able to located some! Happy Thanksgiving to you and your family! Beautiful table. And that dapper Mr. Turkey is the star of the show! Happy Thanksgiving! 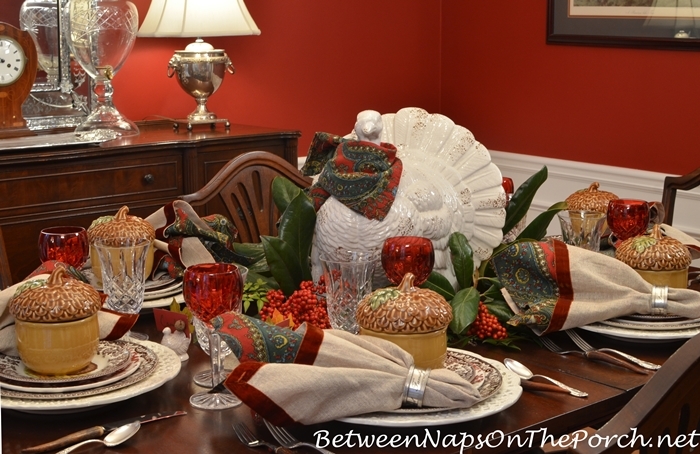 Your table is wonderful Susan, I love the dressed up Mr. Turkey, and the cranberry stemware paired with your new acorn tureens and those wonderful napkins! Have a wonderful Thanksgiving! Happy Thanksgiving!!! Susan, I am so grateful for you. Gratitude at its highest for you and your wonderful blogging. Thank you. You have taught me many things I’m totally appreciative. Have a great day. Happy Thanksgiving Susan, to you and yours!! Your table is beautiful. As Dawne above has said, I’m grateful for you and your blog and have gotten a lot of good ideas from it over the years. Thanks so much! Love it all, Susan! The acorn tureens are wonderful. Happy Thanksgiving!! How nice you can be a guest this year!! 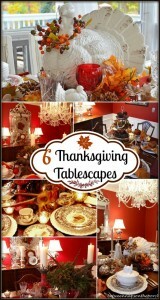 AMAZING Thanksgiving table! 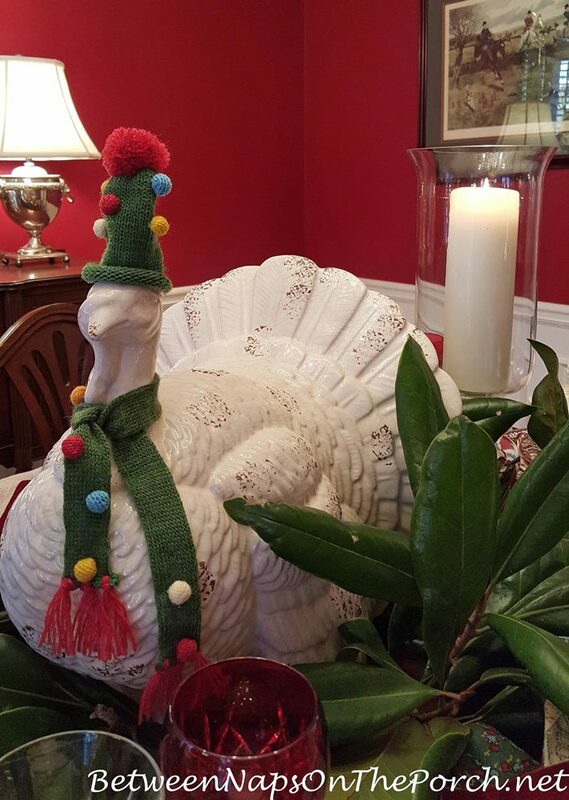 This is another way to “Dress The Turkey”! I am smiling with sound. 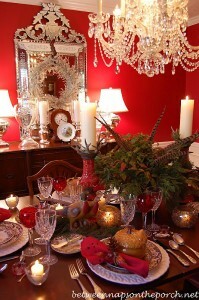 I love the color scheme, gold, burgundy, browns used for this table. The tiny little turkey used for place setting cards is perfect. Great idea in using double napkins, adds interest. Susan, Have a wonderful Thanksgiving with you family. Happy Thanksgiving! My tofurkey is in the oven now! Thank you for all of your lovely posts through the year! In Australia we don’t celebrate Thanksgiving, but a group of friends here celebrated an early Thanksgiving with our American friend this week and we had a wonderful time learning about the traditions behind Thanksgiving and enjoying the food. Beautiful table!!! Happy Thanksgiving to you and all of us who follow you daily! Don’t know about anyone else but I am stuffed like a turkey! Ate entirely too much but it certainly was good! What lovely things. Thank you for sharing . Wishing you and yours a Happy and Blessed Thanksgiving. Just beautiful I love your big Turkey. I forgot to put the napkins out this morning. When my grandchildren got here they had a bag of napkin rings they made decorated with turkeys and pumpkins. They were so proud of there work. I hinted Christmas ones would be nice. Your Mr. Turkey is really beautiful, especially with your red walls. What is the name/brand of red you used? It’s perfect for your room! I love your entries, and that you tell us about so many items in the photos! Very helpful! Thanks so much, Joanne! Hope you had a wonderful Thanksgiving! The paint color in my dining room is a Benjamin Moore color named, Raspberry Truffle. I saw it in a living room once on a Christmas home tour and loved it! Fortunately, one of the homeowners was present so I could ask about the color. Oh my, I think the acorn tureens are amazing!!!! I do love Tom Turkey as well. 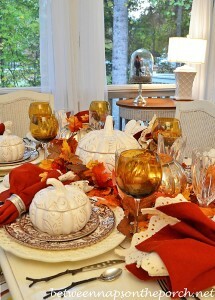 You really created a welcoming and beautiful table scape! I have been away from blogland for a long while (too long) and I can’t wait to visit some of the beautiful and creative inspirational links!!! Happy Belated Thanksgiving.